Recently Lloyd, UK Games Expo’s Games on Demand extraordinaire, pointed out that my usual 40 minutes to one-hour explanation of the game’s setting doesn’t hack it as a quick and fast intro to a table full of expectant players. To avoid Lloyd’s displeasure in the future, and provide a smoother introduction for my players in the future I came up with this introduction. Its already been used to great success during my convention games at Continuum 2018. 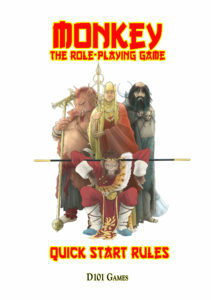 This quick intro while tailor-made for Convention games (which last 3-4 or even less) or quick 1hour demos, can also serve you well as the introduction with your home group to quick one-shots or even an introduction for a full multi-session game of Monkey. These checklists are presented as bullet points which you should be able to move through quickly. The game world is a heady mix of Chinese religion and mythology, set in the reign of the 2nd Emperor of the Tang Dynasty in 8th century China. All the immortals where part of the Celestial Bureaucracy that runs the Universe, until their Weakness caused them to be thrown out. They are now working as troubleshooters for various immortal patrons, to redeem themselves and regain their place back in Heaven. The source of many of these troubles is wicked Demons, who prey upon innocent humans and want to eat holy people. Take one set of playing cards for the players and place them on the table near them. Ask one of the players to shuffle the deck, take out any spare cards and make sure there is only one joker. Put the Narrator’s deck down between them and you. Shuffle the pack (or ask one of the players to do it). Explain that when the outcome is less than clear, you will call for an Action, and the players involved will draw cards from the player’s deck, while you do the same for the opposition. You will play your highest card first so that the players can see what they need to beat. See page 227 of Monkey for an example table set up. 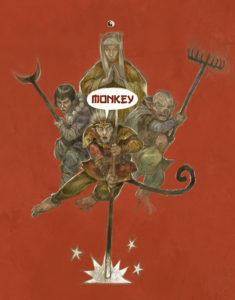 Determine who starts with the spotlight (see Monkey page 119). Give them an item that clearly shows they have the spotlight. I’ve used a Chinese Fortune Cat statue, a small box of my business cards, an oversized D20 and when I remember a lovely knitted Monkey that my friend and fellow Monkey Narrator Gwen made for me, as my table’s Spotlight Marker. A Name. This takes the form of a nickname in English. Origin. How they became immortal. Two Attitudes. One the more active forceful Yang force, and one for the more reactive subtle Yin force. Weakness. That gets them into trouble and what got them chucked out of Western Heaven. Three Skills. These are the character’s broad skill sets. The number is the base number of cards they draw from the deck when performing an action. A set of Magical Powers. A Magical Weapon or Tool. These elements of the game I’ve found really drag out the introduction. You can cover them if the players ask, but really you should take a “show not tell” attitude and deeper explanation should come out in play when needed. Detailed setting information. 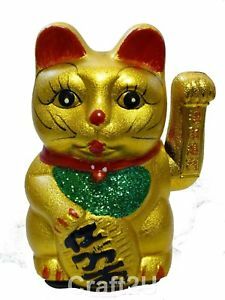 Such as the precise set up of Western Heaven, the hierarchy of the Jade Emperor and Queen Mother of the West, through the Ministries. Likewise how the Celestial Bureaucracy works on Earth, and how the Ten Courts of Hell infernal workings. Using the Journey to the West as an example. It’s tempting to use Monkey and the rest of the Pilgrims’ adventures as a set of ready-made What I’ve found is that that there is a range of player knowledge of the Novel (some don’t know anything, some have seen one of the TV series, and some are in-depth scholars), so as well as the temptation to over explain myself I have to fill in the gaps based upon the table’s collective knowledge. So it’s not as straightforward as I think it should be. An overly complicated explanation of Yin/Yang. Keep it deliberately simple, and let explanation come out in game. A detailed explanation of the game system, beyond what is quickly explained during the run-through of the character sheet.